Be sure to scroll down to "Miss Baltimore", the nudes series, and her cats. Enjoy! My time right now is chocked full of deadlines. This next Friday, June 30th, a wine reception featuring my "Crinkle Quilts" is taking place at the gallery, Good Goods, in Saugatuck, Michigan. YEAH! WHOOPEE! My first ever! Also, we're hosting a family reunion here at the cottage. The first event for our gathering is that wine reception. This is the story of how Good Goods and I connected last fall. The gallery was looking for new (unseen) artists in the fiber medium because the Convergence symposium is taking place in Grand Rapids at the end of June (this next week). 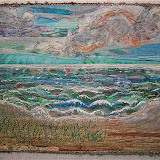 It is the biennial, international conference sponsored by the Handweavers Guild of America, Inc. (HGA). My timing in approaching them at the end of last summer with my art couldn't have been more perfect. Good Goods represents varied art mediums plus high end manufactured crafts ... lots of Sticks furniture and Yardbirds metal sculptures, as well as artists Chris Roberts Antieau, Tim Harding clothing line and his art pieces, plus a number of other artists. They gladly kept the pieces that I had with me in Michigan. I'd brought them up here with the intent of approaching galleries. I'm really happy to have connected with this one. 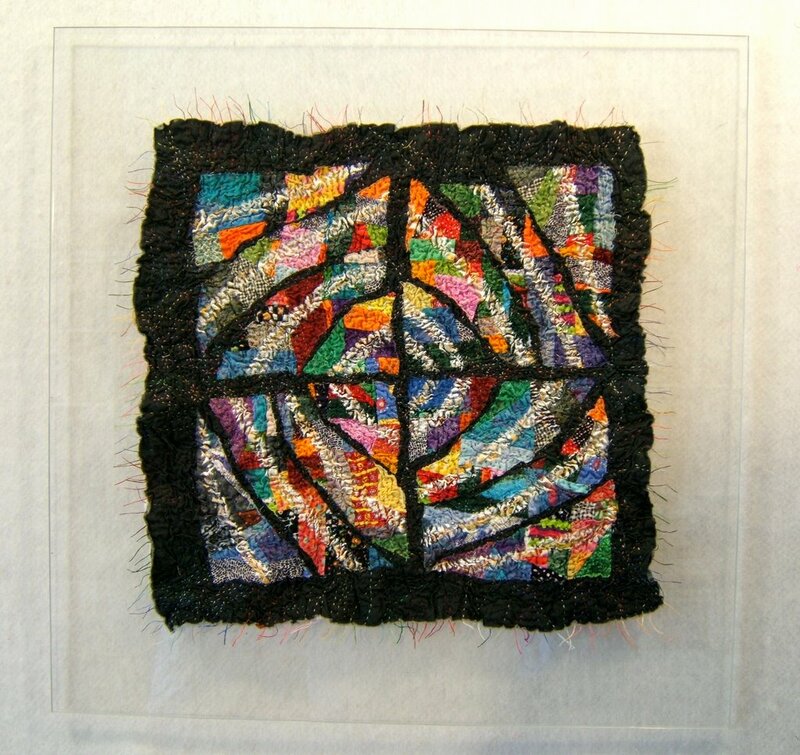 back side detail of "Circle 'round"
I delivered seven more framed up pieces this summer. The last three are mounted on plexiglass (finished and mounted since I arrived). I drill "buttonholes" and tie the piece onto the surface with the knots on the back. I love that the piece isn't flattened out, that the shadows reflect behind it, and how the quilt appears to float off the wall. I had to come up with a different way to handle those thread ends that fram the piece. On the day that I was really struggling with what to do with all those long floppy threads, I had been describing Dottie Moore's short spiky hair (along with her other amazing attributes) to someone. That look was my solution ... she surely had to use a product to get her hair to stand up, so I used gel medium for the same purpose. (Dottie got a kick out of this story). I won't be posting here for the next week, or so. There's still quite a bit of preparation for the gathering of our clan and then the fun of their all being here. This is our first "reunion" since my mother-in-law died. When she was living, we gathered for Christmas's in Tennessee and here at the cottage in Michigan often. This would've been her 100th birthday, so we're honoring her memory with this coming together of 3 generations in her most favorite place in the world. Her father purchased this cottage when she was 12 years old. Our grandchildren are the 5th generation here. Just a quick posting today. 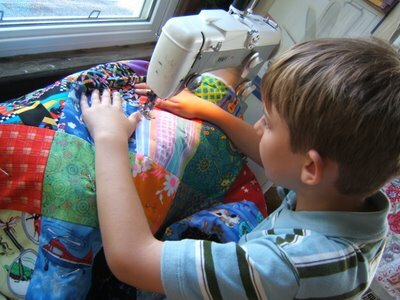 This is for those interested in how I set up and mentor my grandson's sewing on the machine. Winston spent a week here at the cottage. Much time was spent in the studio. Although, if he had his way it would've been even more. He had decided to make a quilt ... a pretty big quilt. The first step was to choose 20 fabrics from the drawer full of novelty prints. I cut his choices into 6" squares. 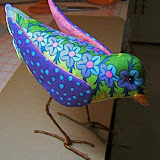 That was enough "sewing" for one day. Most of the next day was spent arranging and rearranging those squares on the design board. I recall at this point he decided 5 more were needed. He had fun looking through the reducing glass and the wrong end of my studio binoculars. He actually determined where changes and additions were necessary by "seeing them from a distance". I got busy with my own project and neglected to take photos every day. The sewing machine was set up on a low end table. Winston was able to sit at the machine in a childs sized chair. We went through the basics of sewing machine operation. I taped a stack of post-it sheets next to the edge of the sewing foot to help quide the fabric. 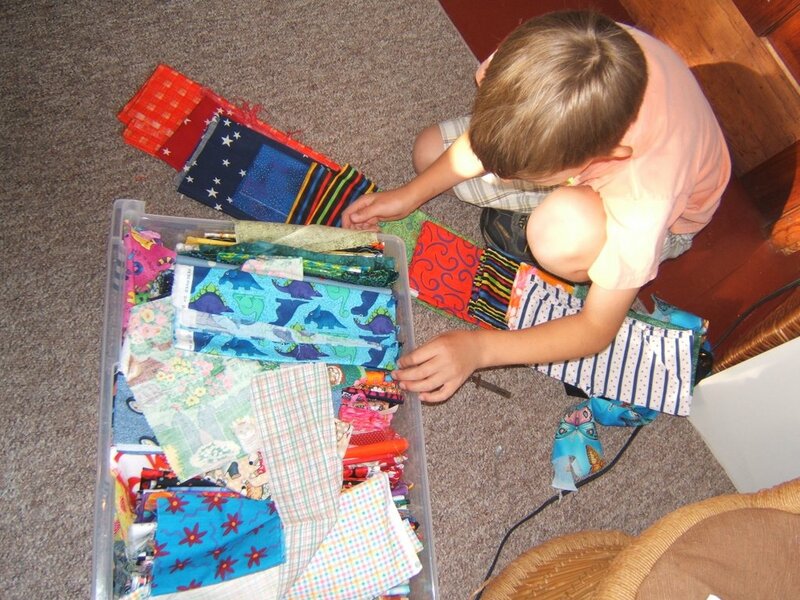 After he had sewn the length of 2 strips together that had been trimmed from one of my projects, he had full control and began piecing his blocks. I was adament about determining where 2 pieces were to get the seam while they were still on the design board. I instruct the 2 blocks be viewed as pages in a book, then for him to close the book and and take both pieces off the board together with his fingers only on the edges that get pinned where a books spine would be. Winston took the pair of blocks to a flat surface and placed 3 pins. He took care to match the edges and all of his seams were PERFECT. There was a bit of a challenge sewing rows of blocks together. He got the principle of opposing seams and just about all the blocks matched. 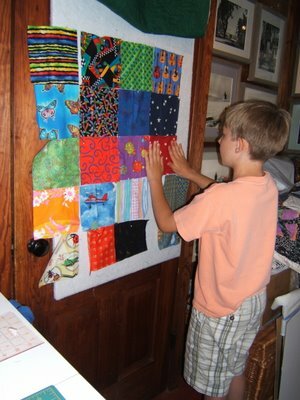 He got a kick out of using a sliver of soap to draw quilting lines across the diagonal of the blocks. We tried the chalk wheel, but the lines didn't stay on the fabric long enough. On his breaks from sewing, he poured over the instruction book for that Pfaff 360. At some point he got the hang of threading up the machine and using the built-in needle threader. He gets to finish the quilting in his mother's studio on her old sport Bernina machine. Says he'll wait to sew the binding on with me. Whew! I'm back. Our younger son's family had been here for a week plus. It was fun getting Tessa (5) and Winston (7) machine sewing quilts. I'll post about their and the the twins projects done already this summer in the near future. Both son's families just left for Chicago ... and WHEW! here I am. 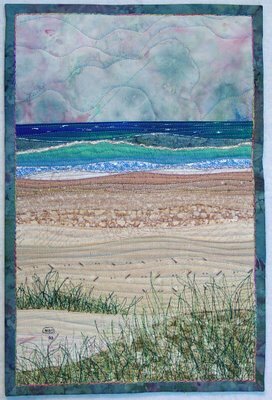 I was so pleased that I could "make waves" using Karen Eckmeier's Layered Curves technique, and I just had to see if I could do it again. Or was I just lucky the first two times (refer to two previous postings). 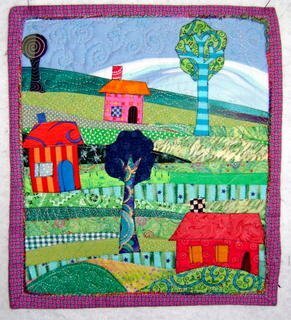 The instructions in AQS's magazine, American Quilter (Summer 2003) are extensive, including tips about perspective, values, and the effects of a chosen format (vertical/horizontal). 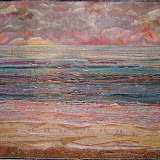 I started out with the intention of depicting the sun setting over Lake Michigan. 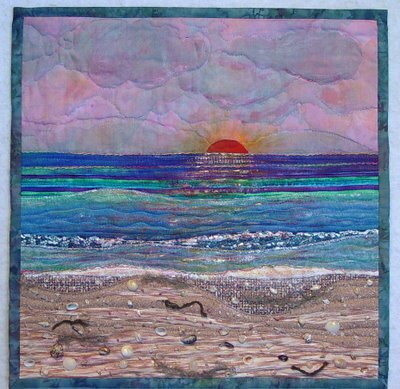 However, after it was machine quilted it just didn't feel like a sunset. It "felt" more like a sunrise over the Atlantic Ocean. Consequently, the handful of really tiny shells that I had sifted out of the coral sand through my fingers on Waikiki Beach in 1982 were glued to the beach along with the "flotsom and jetsom". 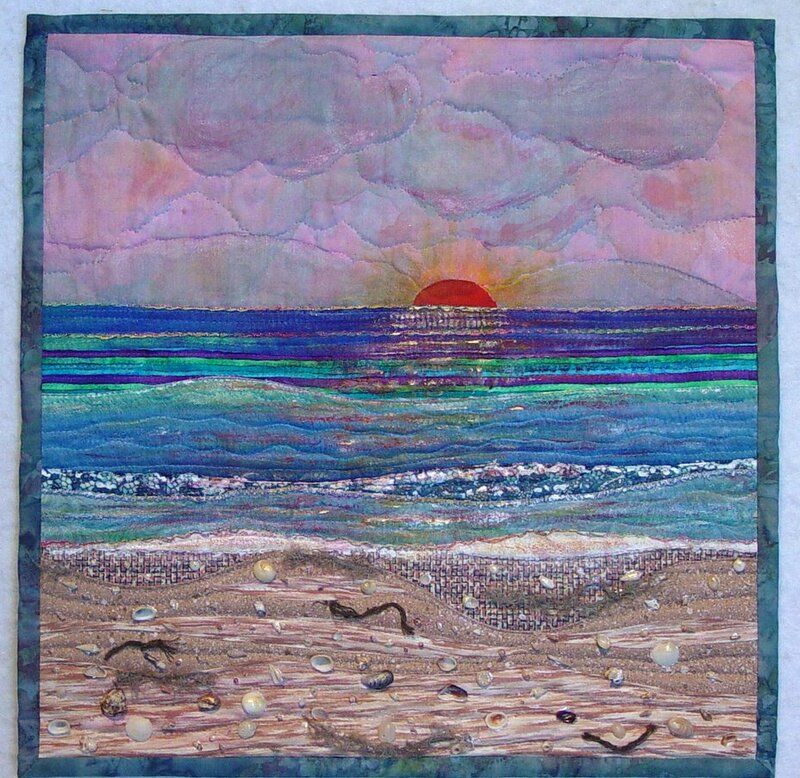 By the way, this was my first sun over water quilt. 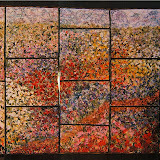 To view the others, go to my August/September 2005 postings. The basic Layered Curves technique is to free-hand rotary cut fabric into strips with gentle curves. The top edge of each piece is turned under 1/4" and pressed. Begin the sequence at the top of the quilt and layer to the bottom. Karen instructs to top-stitch all the strips together in a top to bottom sequence ... then turn the whole piece over and trim away any excess fabric ... then layer that stitched together top piece with the batting and backing ... and then quilt it. The one major thing I did differently from these instructions, was to layer the curved pieces on top of the batting and backing. 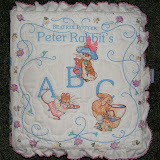 The top stitching that holds one piece to the next also became a line of quilting. 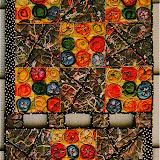 I had lifted the flap of each just sewn down/quilted piece to trim the excess away. Also, I added paint and oil pastels as well as couched yarn (the foaming crest of the waves) to get the effects that I desired. In the afternoons we would take iced capacinos and sit on the bank of the small lake that I live next to in Tennessee. She depicted one memorable such afternoon from her visit the previous year. That day had felt so crystaline. We were looking at a house across fields of spring flowers up on top of the ridge. There was a clothesline full of sheets billowing in a gentle breeze. For a few moments our part of the world felt perfect. 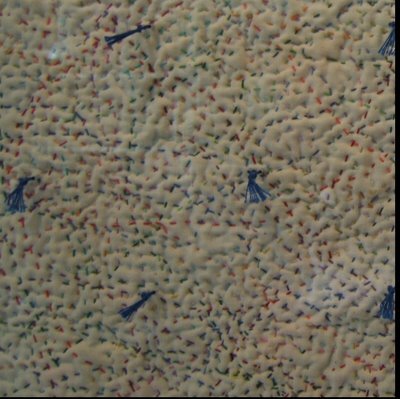 That laundry part has to remain in our memory though, because we just couldn't depict that line full of sheets in this small scale piece without ruining its serene mood. Also, the houses and trees directly across the lake were omitted as well ... even then, we had just looked beyond them as if they didn't exist in our idyllic little world. 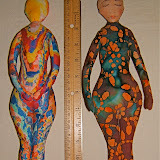 Diane Cross Durand created the following two pieces here at the cottage last summer. I had written about her "discovering" and utilizing this technique to express her style of drawing in the weblog posting titled "Mentoring". 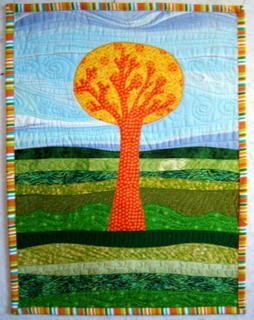 Another difference from Karen's instructions, is that the shapes Alicia and Diane's pieces were bonded and ironed onto the quilt top. The bottom edges of each shape was caught in the seam between the curved strips. Karen instucts the raw edges around the top three sides of any shape be turned and pressed and then top-stitched in place. 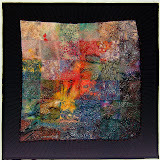 Now I'm excited about playing with Karen Eckmeir's sunprinting with tissue papers that's described (in detail) in the Quilting Arts Magazine summer issue (2006) when Alicia comes to visit me here at the cottage in August. 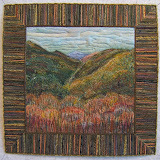 Karen's work is featured on the cover of that issue. If she were teaching any workshop anywhere near me, I'd most certainly want to "play" with her. This is the second quilt scene I ever made. I could hardly believe that I could make the lake look so real the first time, so I had to try it again. The first one (previous post "I'm Here") looked like a storm approaching across the lake. 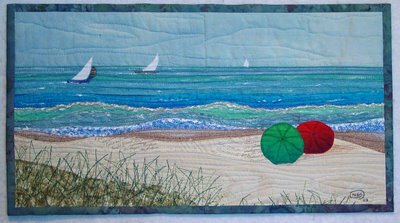 For this one I wanted to make a sunny afternoon with a nice breeze ... a perfect day on the beach ... a perfect day for sailing. And, could I make umbrellas that didn't look like beachballs? Yes! Below are photos that I took from and on the beach less than an hour ago. 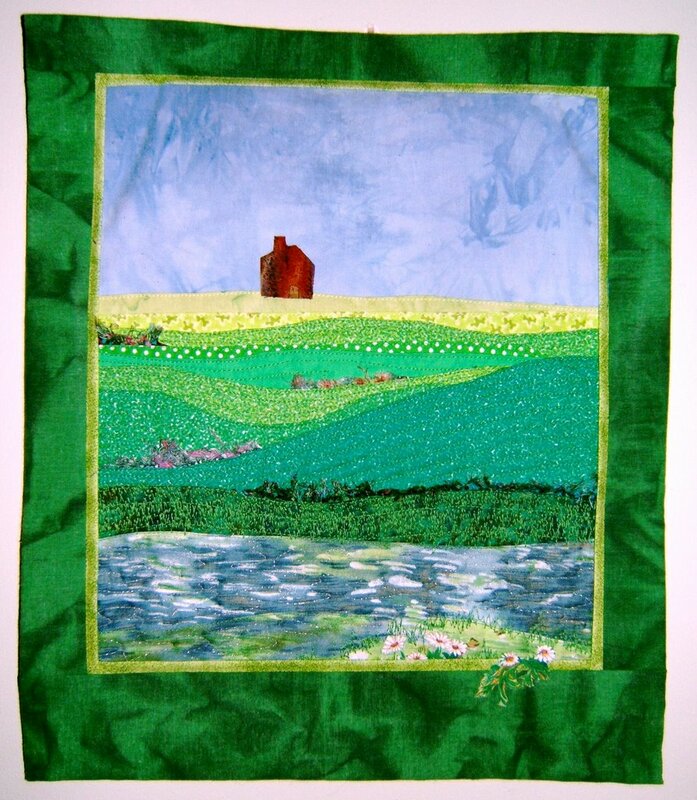 You may recognize this view from the quilt featured in the posting "I'm Off". I hadn't worked from a photo when I made that piece. I just looked at and studied everything each time I was at the beach. 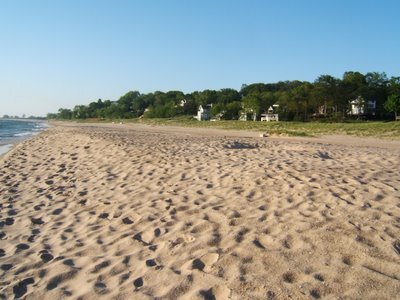 This is the widest the beach has been in the 45 summers that I've been coming here. Definitely have to wear beach shoes across the hot afternoon sand. Our cottage is the one on the far right. We have arrived in Michigan. It hardly seems as if we had ever left. 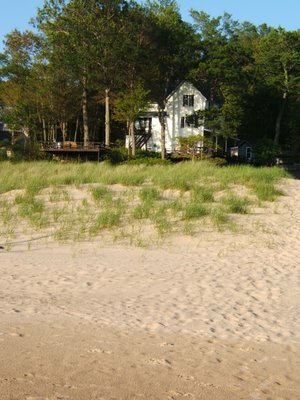 Our young families did a good job "opening" the cottage over Memorial Day weekend. So good, that for the first time in all the 45 summers that I've been coming here I felt that I could just move my stuff in and do "my own thing". The first evening of our arrival I had my Brother s1500 set up and was quilting. Yeah! This is the first quilt scene that I had ever made. 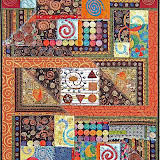 The Summer 2003 issue of AQS's magazine, American Quilter, got me started. 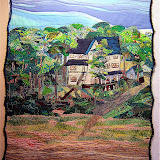 The article, "Accidental Landscapes" by Karen Eckmeier, looked like fun and easy to do. 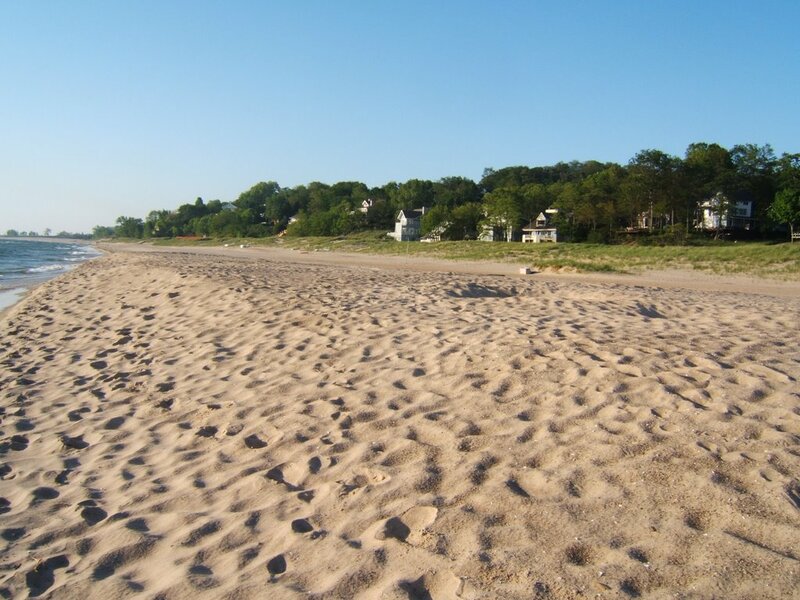 One of her sample projects was a beach scene, so I thought I'd try do our beach on Lake Michigan. This was done while I was in Tennessee and it's from my memory and feelings about this beach that I've been playing on since I was 20 years old. Stay tuned for more pieces done in this technique. I'll also include a general description of the "layered curves" technique.